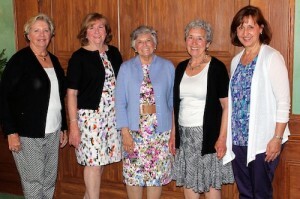 Past presidents, from left, Nancy Kalaher, Karen Thompson, Dorothy Carpenter and Linda Horton, and current president Liz Geraghty. Dorothy Carpenter remembers when she was a “newcomer” in Bernardsville, NJ, 30 years ago. 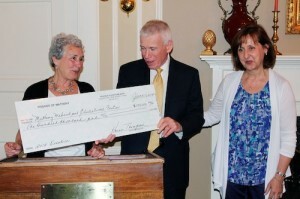 “We ran an auction to raise money for the Matheny School,” she recalls, “and it went extremely well. So we asked Matheny, ‘Would you like to have a friends group?’” That was the genesis of The Friends of Matheny, an auxiliary organization that has raised more than $3 million for the students and patients at Matheny since its founding in 1983. Matheny President Steve Proctor thanked The Friends for everything the organization has given to Matheny, and The Friends presented Proctor with a check for $100,000, which will be used in the coming year to acquire equipment, technology and other gifts that directly benefit the students and patients. Liz Geraghty, Friends president, also revealed that a major project in the coming year will be the construction of a garden in front of the main entrance where families can gather and relax when the weather is warm. The Friends also elected its slate of officers for the coming year: Liz Geraghty, president; Kathy Sisto, vice president, allocations; Helen Fallone, recording secretary; and Karen Thompson, treasurer. Linda Horton, left, manager of The Friends’ Second Chance Shop, and Liz Geraghty present Steve Proctor with a symbolic check for $100,000. This entry was posted in Uncategorized and tagged Dorothy Carpenter, Friends of Matheny. Bookmark the permalink.